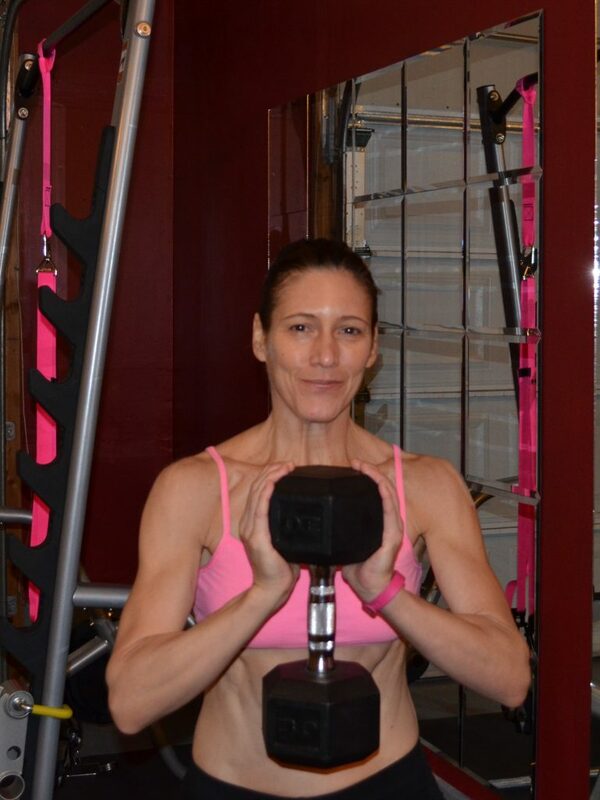 I am 16 weeks into my second year of Precision Nutrition Coaching. I described my first year previously. 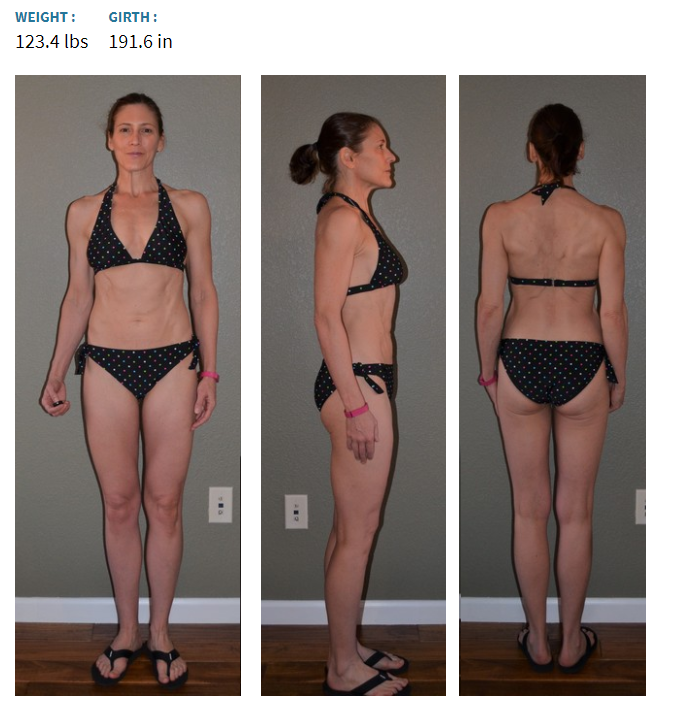 The Cost of Getting Lean is one of my favorite Precision Nutrition articles. 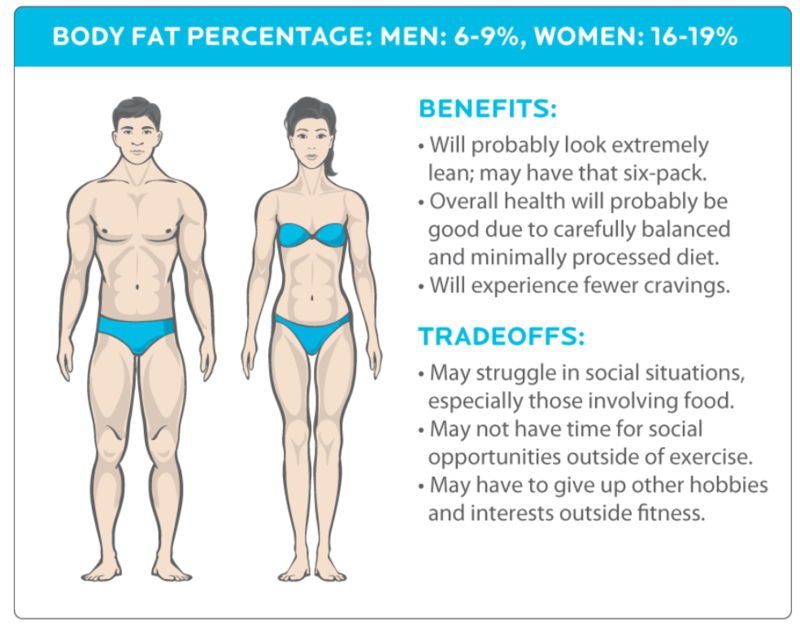 One of my long-term goals had been to get into the 16-19% body fat range (similar to 6 to 9% for men) shown below. The health benefits are clear, but the tradeoffs are hard to sustain. I had a DEXA scan done on Friday (at Body Fat USA in Denver) to assess my body fat percentage. I am finally there, 18.9%, albeit barely! Side note: there is a lot of controversy on the best way to measure and track body fat. For daily use I use an older version of the Omron bioelectrical impedance device. Some folks think they are terrible, but mine has been very close to my DEXA measurements. Typically my Omron is about 0.5% to 1.0% less than my DEXA results. There is day-to-day variation based on hydration, but I use weekly averages for tracking. So, while it’s not perfect, it’s great for trend data. And really does it matter if I’m exactly 17.9% or 18.9% fat? This was my fourth DEXA scan. I’ve done three in 2017 to track my body composition progress. For my first, in 2002, I participated in a research study that included a DEXA scan and cholesterol testing. My body fat at that time was 33.2%, and my cholesterol had hit 288, with my LDL was 200. I was 34 years old and felt like an old lady. While not quite obese, I certainly was not healthy. It’s hard to see from this old DEXA, but my fat distribution was more like Waygu (Kobe) beef – marbled throughout with a thick layer on top, versus my more recent scans. 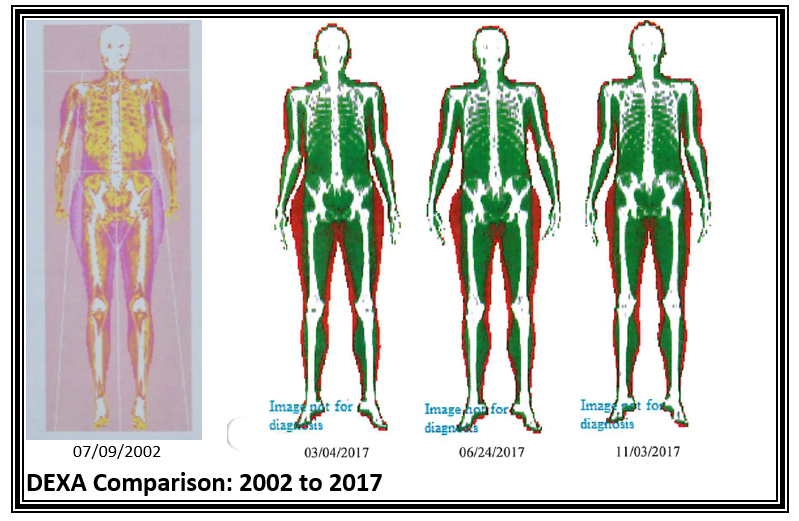 The DEXA images and table with more specific data show that I’ve always carried most of my fat in my legs and hips. I still remember being called “thunder thighs.” I am still working towards getting significant muscle definition in my legs, but they are slowly, millimeter by millimeter, leaning out. My arms and torso have leaned out nicely over the past 16 months. I am starting to see striations in my shoulders, and muscle definition in my arms. My lower abdomen is oddly vascular. 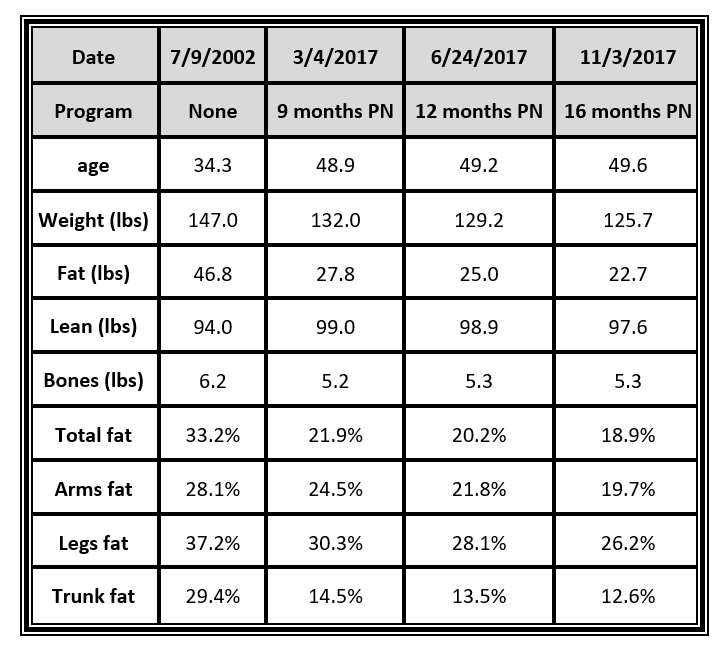 This 4 month cycle had my second formal “cut.” In terms of nutrition, my diet generally follows Precision Nutrition Guidelines – lots of mostly green veggies, lean protein at every meal, smart carbs (fruit, corn, potato, oats, brown rice, chickpeas), and healthy fats (nuts, nut butters, avocado, olive oil). I still eat too many protein bars as snacks – muscle milk, Quest, Perfect, Pottentia (hard to find but these, especially coconut date, are fantastic), and even Kirkland (Costco) protein bars. I do love protein bars! And I discovered Halo Top “healthy ice cream“. Luckily, I generally avoid that aisle of the grocery store. With my current workout schedule (below), I maintain on about 2,150 to 2,200 calories a day. For cutting, I was targeting a small deficit of about 250 to 300 calories a day, so ~1,900 calories a day with 150 grams protein, 175 grams carbohydrate, and 66.7 grams of fat. Like last time, I meant to keep it up for 12 weeks, but completely caved after just 8. I’d find myself late at night eating all natural peanut butter from the jar with the refrigerator door still open. So, the last month has essentially been at maintenance. That wasn’t the plan, but it’s what happened. Still, I’m not upset with my progress, but I am ready to take a break from tracking every gram of nutrition that goes into my body, trying to hit certain macro-nutrient targets at specific times of day based on my workouts. It’s simple and it works, but it’s not easy to sustain. After 12+ years of consistently better nutrition and daily physical activity, I almost accept that I’m a fit person without qualifiers (for a PhD, for a non-athlete, for almost 50, etc). I am fit. Of course the fitter I get, the more I learn that there are whole new levels of fitness, such as extraordinary fitness, where I currently hit only one of the ten physical measures (I can do the pull-ups) listed. There is always more! I’m planning to just maintain for the next month or two. Then I need to decide if I’m mentally ready to mass and put on more muscle (and fat) to get stronger with more muscle definition. There are many benefits to women adding muscle. And I trust the science. But mentally, I’ve spent most of my life trying to get leaner. It’s hard to wrap my brain (emotions) around gaining weight on purpose, even if I logically know gaining weight with my currently training plan will not suddenly create the soft doughy body I used to have. But for now, I’m just going to live in this one, and enjoy feeling fit, and while getting stronger and faster every day.